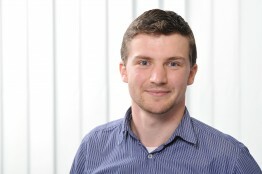 Johannes, what is the SMA Fuel Save Controller and what can it do? The Fuel Save Controller is an intelligent control system that makes it possible to integrate PV systems into diesel genset networks. It consists of three different modules: the interface module, data acquisition module and PV main controller module. It costs considerably more to supply energy with diesel gensets than with a PV system. This makes a hybrid system very economically attractive. The challenge is to achieve a high proportion of PV without impairing the stability of the grid, which can happen, for example, if a bank of clouds rolls in and interrupts the PV output. As the brain of a hybrid system, the Fuel Save Controller monitors the flow of energy throughout the system, managing the PV system to ensure passing clouds or the switching of heavy loads does not affect grid stability. 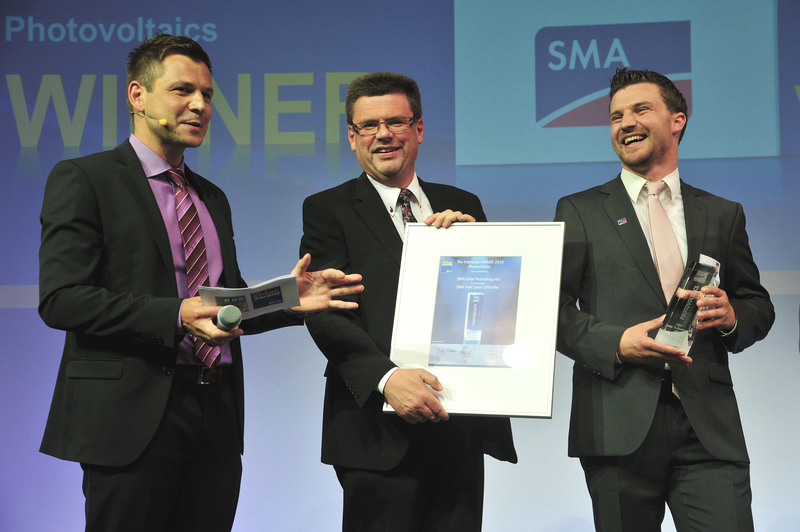 Johannes Weide (right) and Volker Wachenfeld (middle) received the Intersolar AWARD in the “Photovoltaics” category for the SMA Fuel Save Controller at Intersolar Europe 2014 in Munich. The control unit, the PV inverter and the battery inverter come from a single source and are thoroughly tested as a complete system in our Testing Center. From the diesel generator to the battery container, we have everything we need to test a wide variety of system configurations under real-life conditions. This was enormously helpful as the Fuel Save Controller was being developed. With its modular design, the Fuel Save Solution can be used from a few hundred kilowatt to the multi-megawatt range. 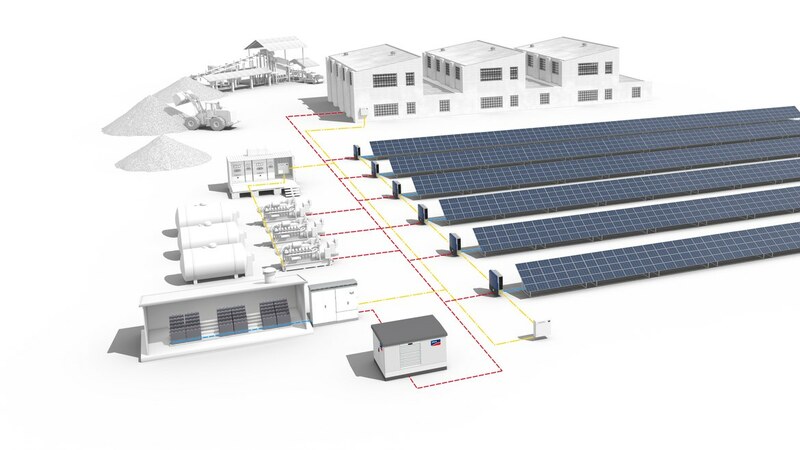 The modular design also ensures that the system can be expanded at any time, either by enlarging the PV system or by adding battery inverters to save additional diesel costs. Every product has its own story. Tell us how the FSC came to be. With the multicluster technology found in the SMA Sunny Island, SMA has long been able to produce hybrid systems of up to a few hundred kilowatts. As a result, we have been working for years on how to integrate PV systems into diesel systems in the megawatt range as well. In addition to technical feasibility, there is the question of making a product financially attractive. As the price of PV systems declined and the cost of diesel rose in recent years, the business case has become interesting. That was the signal for us to move forward and establish a separate division to be well positioned for this market. In 2012, we installed the first Fuel Save Controller System and now we’re working on integrating batteries to save even more fuel. Can you give us a particularly interesting example of where the Fuel Save Controller has been installed? The Fuel Save Solution can be used in a wide variety of systems. For example, we have a very small PV diesel hybrid system at the Athens Zoo where it is employed for training purposes. Even larger installations are also possible, such as the PV diesel hybrid system in Tonga. This is one of our first Fuel Save Controller systems in Oceania. In the Pacific Islands, most of the energy is supplied by diesel gensets, a costly solution that also results in high CO2 emissions. The Kingdom of Tonga has set a goal of meeting its energy needs more sustainably. The Tonga Energy Road Map Agency (TERM) is responsible for this program. The FSC system installed on Vava’u, the main island of Tonga’s second largest archipelago, is an important milestone along the way. The FSC system meets approximately 13 percent of the island’s power demand, contributing to the energy transition in Oceania. Throughout the region, this project and the road map behind it are regarded as a lighthouse project, because it shows that safe, economical energy from renewables can be smoothly integrated into the existing power generation system. Most recently, a series of eight rooftop systems in the Maldives are using the FSC to reduce diesel consumption by 115,000 liters. This region is experiencing great threats from climate change and is committed to reducing its carbon emissions. You also represented SMA at the Intersolar trade fair in Germany, staffing the Fuel Save System booth. What was the question you heard most often? People at Intersolar were very interested in the FSC. Two of the most important topics were the integration of batteries into the Fuel Save Controller systems and the possibility of later expanding the PV system. With its modular design, the FSC is a terrific solution for these needs. Right now, we’re building the first Fuel Save Controller systems that include battery systems. This makes it possible to use more PV energy and optimize the operation of the diesel gensets, because short peak loads can be covered by the battery inverter. As a result, we can build larger and more flexible systems. Finally: Do you have a funny anecdote related to the Fuel Save Controller? Once when we were commissioning the Fuel Save Controller, the system operator asked a lot of questions about exactly how the FSC worked. Then he went over to the PV inverters to see whether they were really operating at full power. Hearing hardly any noise at all, he thought something was wrong. He was all the more delighted to see on the display that the inverters were in fact supplying full nominal power. Stella has worked at SMA as student assistant and wrote about remote regions and special solar projects.